IC 5070, commonly referred to as the Pelican Nebula, is a large cloud of hydrogen gas in which stars are being formed. This nebula is associated with the North American Nebula, it's more popular and more frequently imaged neighbor. They are separated by dark clouds of dust and gas, which give the Pelican and North American nebulae their characteristic shapes. 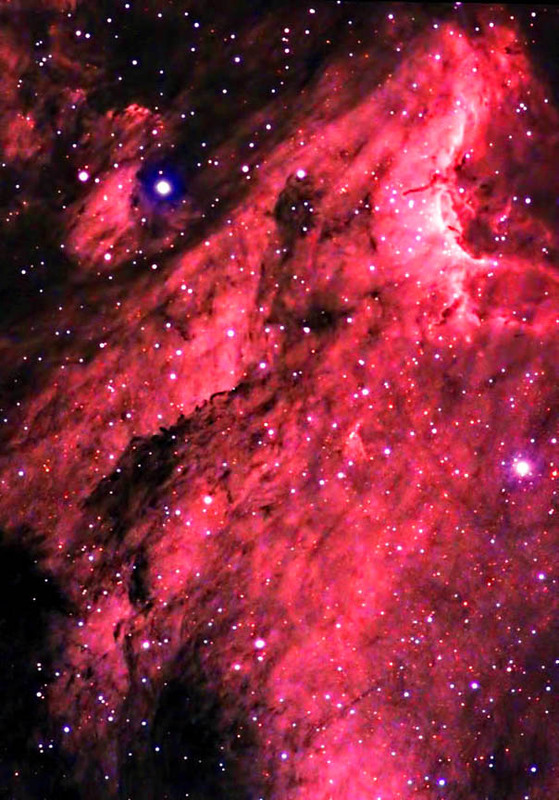 The Pelican Nebula lies approximately 1800 light years away and has a span of 30 light years. The Pelican Nebula contains what are known as Herbig-Haro objects. These are patches of nebulosity associated with new stars, which shoot out narrow jets of gas that collide with adjacent clouds of dust. These ejections are aligned with the star's rotational axis. You can observe a hint of one on the tip of the long pillar of nebulosity at the upper right corner of the image. Astronomically-speaking, Herbig-Haro objects are very transient, lasting for a few thousand years. Color: 30 @ 5 min. Ha images were focused, acquired, reduced, aligned, and combined in CCDSoft. Color images were focused using the camera's live view (and Bahtinov mask). Frames were aligned and combined using ImagesPlus and adjusted in Photoshop. Ha frames were aligned in RegiStar and combined in Photoshop. The adjusted color image and Ha mosaic were also aligned in RegiStar and combined in Photoshop. The final image was further adjusted. Topaz DeNoise was then applied. Captured from my backyard observatory in southeastern Minnesota on July 4, 5, and 11 of 2013. Temperature 65F; humidity was high but seeing was good.